Undermount Soft Close Slides, Drawer Glide Parts - GSlide Co.
Undermount soft close drawer slides is common equipment in the office furniture and cabinetry distinguish. You can find many manufacturers easily; but we are sure that if you want the high quality functional components and service, GSlide Corporation is a professional and reliable supplier that you should consider first. This product's featuring a number of technological innovations is the perfect balance of performance and affordability, with no sacrifice in reliability or ease-of-installation. 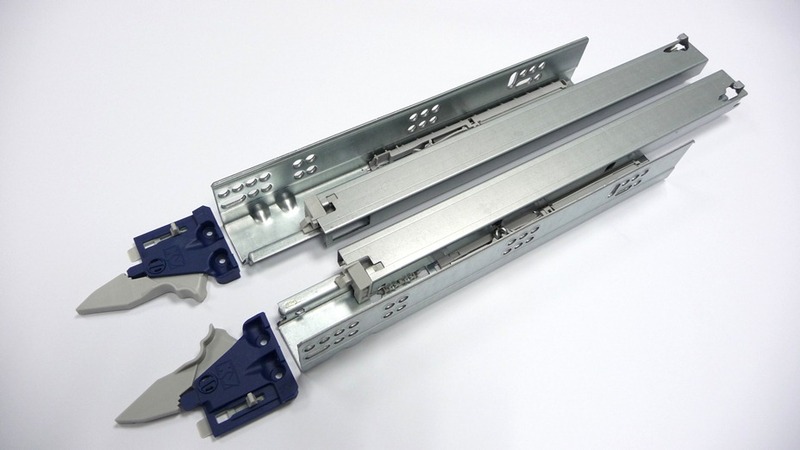 Moreover, undermount soft close drawer slides had Patented Soft-Close Mechanism with Integrated Spring Dampener Technology Delivers Superior Performance. MuV Metric Full Extension Soft Close Drawer Slide fully integrated soft close mechanism features the perfect balance of opening force and closing speed to ensure consistent positive closure. With a long dampening stroke (57mm [2-1/4"] on 450mm [18"] and longer slides)/ the hydraulic cylinder helps glide the drawer closed and eliminates the drawer "bounce" common to air-filled cylinders. The mechanism can be removed and replaced independently of the slide. GSlide Corporation is full of technical experiences and offering a modern in expertise designing and manufacturing high quality functional furniture components. It is sure you will be satisfied with our undermount soft close drawer slides and other products. If you are interested in this product, please feel free to contact us anytime. 1. MūV supports industry standard drawer box construction and features a 32mm mounting hole pattern. 2. MūV features elongated mounting holes on both the front and back of the cabinet member, making horizontal and vertical adjustments fast and simple. 3. MūV’s ergonomic front release levers feature tool free 3mm [1/8”] height adjustment for post-installation fine-tuning. The notched release levers are designed to accommodate various drawer fronts. Open areas allow for better fastener access. MūV is available in two material width models, allowing the use of drawer box material up to 19mm [3/4”] in thickness. All MūV cartons come packaged complete with slides and release levers. No need to order release levers separately. Integrated cassette rollers help to stabilize content load and eliminate sag when the drawer is in the closed position. Stabilizing cassette rollers prevent drawer sag. Inset drawers stay aligned and true in closed position. Avoid the possibility of easy drawer malfunction.